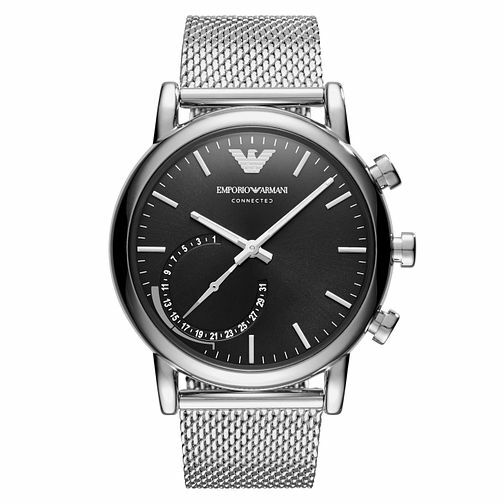 The dynamic styling of Emporio Armani meets technology with a new collection of Hybrid Smartwatches, featuring the most coveted designs with the added benefits of wearable technology. The Emporio Armani Connected App connects your iPhone and Android phone to your Hybrid Smartwatch. Once connected, you can trust your timepiece to always be accurate, select to receive discreet notifications, track your daily activity, take photos and more. The watch runs on a standard coin-cell battery with a four to six months battery life that is easily replaceable by the user, so it never needs to be recharged. Boasting a stainless steel case and matching contemporary bracelet.